I was lucky enough to work with Kimberley Sykes’ Dido, Queen of Carthage company this week. They’ll be performing at the RSC September to October 2017 in what looks set to be something very special. Working with actors is deeply embedded in my own practice as someone working on the early London playhouses; I’m always keen to know how actors see a play, the questions they ask, the methods they pursue in answering them. Holger Syme has written eloquently of the dangers inherent in such a working model, especially the tendency for academics ‘to appropriate acting choices as gestures of textual interpretation’. ‘[T]his [is] a problem’, Syme warns, ‘Because it suggests that actorly decisions are always interpretative rather than creative: that they teach us something about the play, rather than about a particular performance’. I accept some of Syme’s warning here, and am similarly wary of methodology that seeks to use an actor’s decisions now to tell us anything straightforward about an actor’s decisions then. But I’m also quite a bit more relaxed about the issues Syme raises, because the binary between interpretation and creativity is less obvious to me than it is to him. I see the text or the play (whichever term you prefer) not as a fixed initiating document that an actor then acts on, but the product of interpretive creativity from the outset, and indeed only a very partial witness to that process of creativity. That process, in other words, preceded the text as much as it followed and now continues to follow it; it initiated and shaped not only the text’s composition but also its processes of transmission. In this sense, early modern actors were not secondary respondents to a pre-existing text, but its basic preconditions – the text was written because the actors were there, not the other way round – and one of the things I tried to show Sykes’ company is the extent to which Nashe’s and Marlowe’s actors shaped the play they wrote. Dido, Queen of Carthage is Virgil seen through boy company eyes (and bodies). From the dandling of smaller boys by bigger boys through to the tendency for characters to comment on the liveness of onstage time and place (‘Where am I now?’), from the curiously low-status Aeneas to the careful negotiation of stage space, particularly as characters move from left to right or vice versa, this is a play deeply embedded in the staging practices of the company who performed it. I agree with Syme that modern actors may not be able to tell us about how the play was performed or how it was or is supposed to be performed. But then, I often find myself as an academic being asked to tell performers exactly that, and I’m not sure my profession can either. Rather than trying to reconstruct a single performance choice from a stable theatrical text – ‘this is how it was done‘ – I’m interested in the contingent possibilities of a contingently preserved text, both then and now. For that reason, I am excited when an actor identifies a choice in a play text that I hadn’t spotted before, even if it is a choice that could not have existed in the early modern period. It’s helpful, simply, to be reminded that theatrical texts are snapshots of choices made and choices yet to be made. Kim Sykes has encouraged her actors to think of themselves as involved in an authoring process begun in the pre-historical stages of the Dido story, co-opted by Virgil and then by Nashe and Marlowe, and now co-opted once again by her 2017 performers. (For what it’s worth, my sense of Virgil is less colonising than it may be for the company. Virgil’s poem was certainly written in the context of empire-building, and has served a role in the histories of empire-building ever since, but the poem itself looks much more ambivalent about these ideas than its reputation suggests. Virgil’s earlier work and the story that he wanted The Aeneid burned suggests that he may have been too.) Contemporary classical training often encourages performers to think of the text and its author as a kind of boss, sending orders from across the centuries, something that makes me very uncomfortable, not least because it effaces the performer’s right to make decisions, or dresses up such decisions as somebody else’s. In that context, Sykes’ approach strikes me as a wonderfully empowering way to proceed, and one far more in tune with how early modern plays worked in their own period. I’m particularly pleased to be writing this blog the same week that Laurie Johnson wrote for us about the first actor known to found a playhouse. We’re so used to thinking of actors as only responding to a text after it has been written; it is good to remember that both historically and now, text can work for actors rather than the other way around. I was especially lucky that Sykes was open to me leading my session through performance, rather than through a lecture or seminar format. I’m forever anxious about the way performers and academics tend to slip into certain professional modes when they interact, one of them becoming the expert in the room whilst everyone else shuts up and learns. That model is in play whenever an academic is invited into a rehearsal room to observe actors at work, and it’s in play again when an academic is invited into a rehearsal room to speak to the actors. I’m not against the model on its own merits – one group learning from the other’s expertise is always going to be an important part of creativity, training and collaboration – but it worries me that it tends to be the dominant, often even the only way in which performers and academics interact. This dominance reduces the process down to a one-way knowledge-transaction and safeguards its various practitioners from making actual discoveries together. So I was thrilled, as I always am, when Sykes allowed me to hand ‘my’ session back to her performers, giving them a bunch of scenes to talk and walk through and seeing what came back. This meant that no one in the room was ‘the’ expert on what was happening, as we moved in and out of each others’ comfort zones, the performers discovering plays they didn’t know, whilst I learnt from the discoveries they made. This blog post is an attempt to think through what I learnt about both that process and the play at hand, to consider what happens when you see a play you know well from a perspective and with a set of professional needs, expectations and questions that you do not know so well. The post will centre on my responses, not the actors’ conversation: it isn’t my business here to report back on the performers’ confidential and work-in-progress discoveries. But it is, nevertheless, founded upon a number of observations and discoveries made by Sykes’ performers working through the text, and in that sense I thank them for co-authoring this post with me. I’ll start by listing my responses to the performers’ responses to the various responses the characters in Dido make to one another: authorship, not only Virgil’s, Marlowe’s and Nashe’s, but Sykes’ interest in enabling her actors to author their own performances; Nashe (and Marlowe); the tantalising possibilities of a line beginning ‘might we but’; silliness; mightiness; the boundary between refugee and coloniser; the representation of gender. This post responds to a small number of those issues. 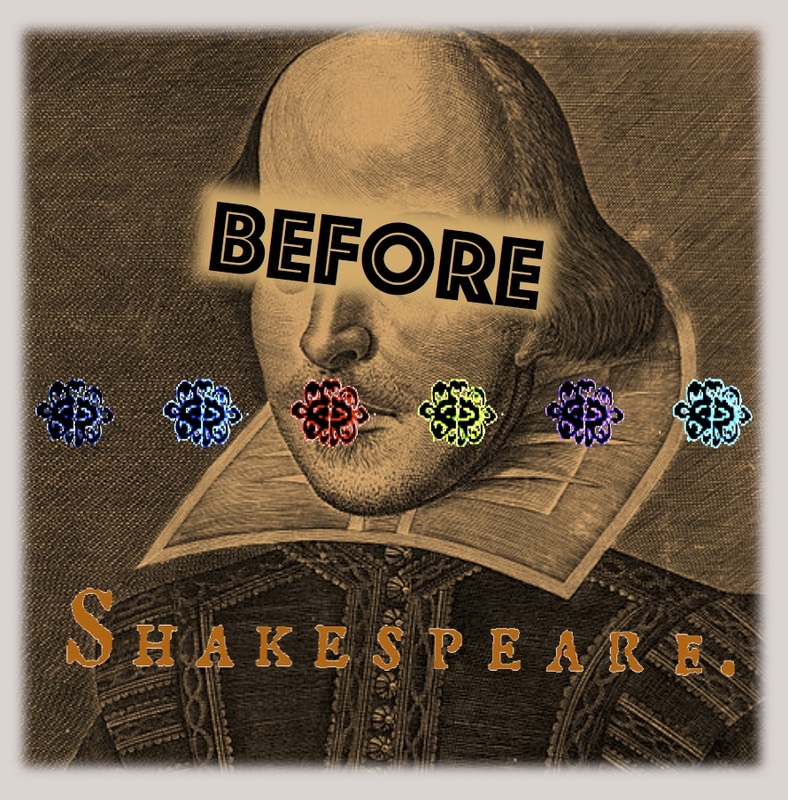 Regular readers will note that many of them are ones we’ve already been exploring on the Before Shakespeare project; some are completely new; still others are unexpected connections between our project research and the performers’ work. As Jupiter to silly Baucis’ house. It’s important, I think, to note that Iarbas here compares himself to a low-status woman, and although there’s obviously something self-aggrandizing about likening yourself to a mythical figure who saved the human race, it is striking that it is Baucis rather than her husband who is invoked. As we discovered in the Shakespeare Institute marathon, sixteenth-century silliness is the language of misogyny, of elitism, of ableism, of civic elites posturing over those who live in the countryside and of the celebration of the human over non-human animals. It’s perhaps worth comparing to the word ‘naughty’, a highly-charged early modern insult which has also had much of the power knocked out of it. In Much Ado About Nothing, for example, Leonato calls Claudio ‘This naughty man’ because he is believed to be responsible for the death of Leonato’s daughter. When an early modern characters calls someone naughty, they are calling them naught, zero, nothing; they are aiming to linguistically obliterate their existence, not sending them to their bedroom. To be silly (or, sometimes, ‘seely’) is to be low-status rather than ridiculous. The Dido company’s discussion has sent me back to the language of silliness, where I’ve seen a much wider frame of reference. An extremely rough list of things described as silly between 1580 and 1610, in even rougher chronological order, would include souls (a lot), sheep, flies, Priam (in Thomas Newton’s translation of Seneca), wretches, conceits, maidens (often), people, age, men, words, birds, shepherd swains, nymphs, daughters, cottages, slaves, botchers, answers, wenches, power (in Marlowe’s Tamburlaine, of all places), lives, cates, pashas, women (perhaps the most common category described as silly), ladies, passengers, secrets, groves, girls, hair, flocks, cabins, lambs, virgins, dames, herds, sailors, vines, fate, thoughts (twice in The Wounds of Civil War alone), boys, the poor, fellows, time, chattering fowls, gazers (ie, onlookers), dwarves, beasts, fish, tongues, fraud, brothers, ignorant sorts, the state of things (twice, in different formulations, in A Humorous Day’s Mirth), desires, groves, barks (ie, ships), damsels, lovers, idiots, jests, fancy Autumn (Nashe in Summer’s Last Will and Testament, I think perhaps my favourite thing to call silly in the whole list), soldiers, foals, dogs, old monks, asses, gentlemen, creatures, faces, old women, mice, flesh, toys, fools, novices, lords, constables, fathers, cities, hands, mice, innocence, husbands, Christians, ships, ants, poets, mistresses, moles, ignorance and messengers. The word is occasionally used as a noun: ‘a young silly’, for example. As a general rule, onstage characters are not described as silly, though they may be compared to offstage silly people, something which strikes me as important in terms of the word’s function and meaning. Lyly’s Mother Bombie, where Stellio is called ‘silly’ to his face, is an exception to what otherwise looks like an unspoken rule (unspoken in the double sense of an unarticulated rule about how a word must not be spoken onstage). In Thomas Lodge’s Catharos, Diogenes worries about the fate of ‘both myself and the silly ones’, which I strongly feel should be adopted as a band name at once. The list above gives us a kind of anatomy of silliness in these years, in which people (particularly but not exclusively women, the non-elite and the non-normative), places, transportation devices, body parts, animals and concepts all get dismissed as silly. But it may be possible, too, to historicise this word, to note, for example, that it is not used in Robert Wilson’s 1581 Three Ladies of London but is used repeatedly in its 1589 sequel, The Three Lords and Three Ladies of London, which might suggest that it becomes an important part of the playhouses’ onstage fictional worlds through the 1580s. What is notable, though, and an important part of the Dido company’s reaction to the word, is that from the mid-1590s onwards (the cut off point, perhaps not coincidentally, for our project), the word is much less likely to be used in plays, and especially in plays taking themselves seriously. ‘Silly’, it seems, became silly in the modern sense in about 1595 and has stayed silly ever since, which perhaps explains why the Dido actors are intrigued by it. This connects the word with a number of others that radically change their meaning around the mid-’90s, probably in response to the playhouses: author, playwright, actor, theatre, playhouse. The early plays from the playhouses, including Dido, have frequently been dismissed as themselves silly, incompetent or immature (in Dido‘s case, this has been especially literal in the way that scholars discounted statements about the play’s performance history made on its titlepage and instead imagined an alternative history for it as a piece of university juvenilia). Might this be linked to semantic shifts which cut their very words off from us? Has ‘silly’ contributed to a sense of the earlier period’s silliness? Early modern plays are, after all, full of words that subsequently change their meaning. I can still remember my teenage bafflement on reading that one of Shakespeare’s kings entered the stage ‘with his train’ (what an entrance), or hearing Richard II end with a reference to ‘untimely bier’ (subsequent experience has convinced me that there can be no such thing as an untimely beer). What’s striking about ‘silly’ is that it changed its meaning during rather than after the period, and is therefore a distinctive part of the language of the early playhouses and their plays (and distinctive in its relative absence from later plays). If I’m right about that, then Ben Jonson in Sejanus may have been deliberately employing jarring language when Nuntius refers to the ‘childish silly innocence’ of Sejanus’ butchered children. In Friar Bacon and Friar Bungay, a play much taken with dairy products, cheese is described as ‘jolly’ but not ‘silly’, which I feel is very much how it should be. Perhaps that shows us an early anticipation of the shift away from the word ‘silly’ onstage, or perhaps it helps us think through the difference between jolliness and silliness or the cheesiness of cheese. So there’s an example of performers posing a question that has sent me off on a word search. Reading my response, you may well feel that, as Robert Some wrote in his 1588 theological treatise, ‘your answers are silly’. Either way, I’ll never feel quite the same way again about Christopher Robin and his silly old bear. Is nothing here, and what is this but stone? This happens after a succession of all-male scenes and immediately before the first entrance of Dido, and once Dido does meet Aeneas and hears the tales of Troy, her own response and that of her sister is to want more information on the lives and deaths of women: ‘O, what became of aged Hecuba?’; ‘But how ‘scaped Helen, she that caused this war?’ I’m planning a fuller blog post on the representation of gender in the early playhouses soon, so I’ll confine myself here to observing that 1) this play could have been called Aeneas; 2) it delays the entrance of the character its title identifies as central, much as Lyly’s Sappho and Phao and Endymion treat their queen figures; 3) it fills the play world with men for the audience’s first glimpses of both the heavenly and the human worlds; 4) it then shows us worlds that are vitally and self-consciously female-centred. ‘Where is Hecuba?’ ‘What became of aged Hecuba?’ ‘How ‘scaped Helen?” These are troubling and exciting questions to ask at a moment when the play has got lost in all-male politics in front of representations of Troy that efface the women. And it’s not just that they efface the women: what’s important is that Aeneas sees that effacement and makes it his first comment. This is a representation of the male reception of the non-representation of women. Having written about the single word ‘silly’, I’d like to close by turning to the performers’ interest in a multi-word, monosyllabic formulation, ‘Might we but’. Speaking to Iarbas and longing for his lord, Sergestus says ‘Might we but once more see Aeneas’ face’. This sent me back to the play’s opening scene, when Ganymede says ‘Might I but see that pretty sport a-foot’ (he’s referring to Juno being bound and hung from the heavens, so this line establishes him as A Very Naughty Boy). Marlowe has a reputation for bombast, exoticism and metrical power, and I’m always excited to see lines such as these that challenge that reputation in their simplicity, straight-forwardness, clarity and precision, so I’m closing this blog post by thinking about Marlowe’s verse more generally, the idea of metrical power and the import of these particular lines. Ben Jonson described Marlowe’s verse in terms of its ‘mighty line’. It’s a phrase that, like many of Jonson’s descriptions of his contemporaries, we have come to rely too much upon. In the same poem, for example, Jonson describes Shakespeare as a ‘sweet swan of Avon’ and ‘Not of an age but for all time’. These have become archetypal phrases for Marlowe and Shakespeare respectively, and it’s always good to remember that they’re also the partial and particular language that Jonson happened to pick in the moment of composing his poem. It’s a poem, too, written to preface the 1623 Shakespeare play collection and therefore also serving an advertorial function: it’s no accident that these phrases have become scholarly soundbites. But rather than accepting Jonson’s language and leaving it at that, I wonder if Jonson’s sense of Marlowe’s mightiness does helpfully pinpoint a term Marlowe himself or his early audiences and readers cared for. To give a few examples, emperors and an army are variously called ‘mighty’ in The Massacre at Paris. Calymath in The Jew of Malta is called ‘mighty’ twice, almost as though in epithet. Lucifer is twice addressed in this manner in the 1604 Doctor Faustus, and by a Faustus who believes that ‘A sound [ie, excellent] magician is a mighty god’. The 1616 Faustus retains these references to Lucifer but compares a sound magician to ‘a Demi-god’, and includes two new descriptions, one of Alexander the Great, the other of the Emperor Charles, as ‘mighty’. Outside of his dramatic work, Marlowe’s translation of Lucan refers to Rome’s ‘mighty walls’, and even Leander in Marlowe’s section of the poem Hero and Leander wants to chase away the Hellespont with ‘mighty violence’ (who knew there was any other kind?). But where these works employ the word ‘mighty’ only once or twice, the two Tamburlaine plays are veritable display-chambers of mightiness. Within the two plays the word appears over 60 times, but just as striking as these in-play uses of the word is the fact that it also appears all over the 1590 printed book in which the plays survive. A bit like Jonson’s prefatory poem to the 1623 Shakespeare play collection, these aspects of the printed Tamburlaine are there as a marketing device and help to show us that the word ‘mighty’ had come to quintessentially describe the play and its central character. On the title page Tamburlaine’s career trajectory is described ‘from a Scythian shepherd’ to ‘a most puissant and mighty monarch’, and in his prefatory epistle the plays’ publisher tells his readers that ‘the Scythian shepherd […] became so great a conqueror, and so mighty a monarch’. Turning the page and beginning the first page of the play’s script, the reader finds a new heading once again pinning this term onto the protagonist: ‘The two tragical discourses of mighty Tamburlaine’. Even before encountering the more than 60 uses of the word in the plays’ scripts, the reader had seen it used to describe the protagonist three times already. The word stuck to Tamburlaine, inside and outside the play, and Jonson’s description of Marlowe’s verse suggests that it stuck to his author too. As the figure of Machiavelli says in the prologue to The Jew of Malta, ‘Might first made kings’, and Marlowe’s plays are much concerned with the process of mightiness that makes and unmakes monarchy. But the word ‘might’ might have a very different meaning, of course, reaching less for the language of power and more for the language of possibility and impossibility. In grammatical terms, the verbal ‘might’ introduces a conditional voice: this thing might happen, or it might not. Onstage, it therefore encourages the audience (and the character) to look to the immediate future, negotiating and perhaps changing it. Marlowe’s plays are full of people determined to change the future that society wishes to give them: the low-status Tamburlaine and Faustus (‘of base stock’ is the first thing we hear of him) are obvious examples, as is the Jewish Barabas surviving in an anti-semitic world. The 1604 Faustus is a great deployer of ‘might’ in this sense: ‘What might the staying of my blood portend?’; ‘fain would I have a book wherein I might behold all spells and incantations, that I might raise up spirits when I please’; ‘Now would I have a book where I might see all characters and planets of the heavens, that I might know their motions and dispositions’; ‘O might I see Hell, and return again, how happy were I then?’ As the chorus says of this man after his damnation, ‘Cut is the branch that might have grown full straight’. The three troubled lovers in Edward II, Gaveston, Edward and Isabella, also use the word to express their desires. Speaking to an absent Edward, Gaveston says that ‘these, these thy amorous lines [written in a letter]/ Might have enforced me to have swum from France’, whilst Edward wishes of Gaveston in return, ‘might I keep thee here, as I do this [picture]’ and says again, a few lines later, ‘O that we might as well return as go’. Edward’s queen, Isabella, wishes ‘that I might pull him to me where I would […] That when I had him we might never part’. Much later, Edward yearns ‘that I might this life in quiet lead’ and ‘might I never open these eyes again’. Confronted with the choice to resign the throne, Edward comes out with the wonderfully double-conditional ‘would I might’. But I hadn’t realised until I joined the Dido company that Dido twice opens blank verse lines with the word ‘Might’ followed by a personal pronoun (‘I’ or ‘we’) followed by a diminutive ‘but’. ‘Might I but see that pretty sport a-foot’, says Ganymede; ‘Might we but once more see Aeneas’ face’, says Sergestus. It’s not an especially unusual formulation, but what does seem unusual is its repetition across the play. I guess there are two things going on here for me: 1) as so often in this play, the conversation, flirtation and actions that pass between Jupiter and Ganymede anticipate and colour the rest of the play, and 2) beyond this structural effect, the repetition of this phrase points us to the sheer sense of need, the hunger for human transaction, that haunts this play. ‘Might I but’: encoded in those three monosyllables is a strong sense of self (I), a strong sense of need or desire coupled with a strong sense of the possibility of its denial (might), together with an attempt to downplay that need or its fulfilment by flirtatiously or desperately belittling it (but). I am here, I matter or I am in danger, I need this thing, but this thing is only tiny. Give it me. If you can. Can you? I don’t know. It’s a tiny phrase, not immediately obvious in its distinctiveness, and it places its character in the live uncertainty of need. And the audience too. Having summoned Aeneas and his men back from their ships, Dido says, apparently to the audience, ‘See where they come, how might I do to chide?’ ‘How might I do’: it’s a pretty extraordinary thing to ask an audience, placing them squarely in the live predicament of a character’s agency, actions and doubt. Early modern characters often ask the audience what to do, as when Lyly’s Galatea asks ‘What shall I do?’, or Webster’s Duchess asks ‘Shall this move me?’ But Dido’s ‘how might I do’, encoded in the conditional even as it is posed as a question, feels doubly uncomfortable, uncertain, indefinite. It’s the ultimate performance question. Given Kim Sykes’ interest in the play and playing as multiple kinds of authorship, here is a character authoring her uncertainty over how and what to author. This is, the play’s title page tells us, as much a Nashe play as a Marlowe play, and I’ve written elsewhere on the collaborative nature of Marlowe’s work as well as the author-aware nature of Nashe’s. But what I’ve learnt most from Kimberley Sykes and her wonderful team of actors is that Marlowe’s so-called mighty line is mighty in a less familiar sense: full of the possibility and possible impossibility of how one might do things. That’s a mightiness I can get behind. It strikes me that to call this a ‘challenge’ to the idea of metrical power would suggest that metrical power and simplicity are opposed, or non-aligning concepts. But to take an example from Shakespeare (sorry), ‘I wasted time and now doth time waste me’ seems to be both – a line that’s simple but also powerful in its metrical exactitude/symmetry. Though symmetry might be a misleading concept given ‘waste me’ has a different stress – anyway. So my question really was what this ‘metrical power’ consisted of – is it analogous to something like ‘momentum’, where the power of the speech builds over multiple lines with little mid-line breaking/variation, and a lot of enjambment, the way some of Tamburlaine’s speeches roll off the tongue into a great crescendo? This is relevant (if at all, to anyone) in as much as how the ideas of ‘power’ and metre align has implications for what we think about both. Is metrical power flexibility, fluidity, a varied keyboard – power in the sense of a moving, affecting use of the resources of verse? Or is power a sort of univocal, headlong, barrelling, Marlovian masculinity? Which would then suggest certain things about blank verse as a vehicle for that (if its most powerful version is its most belligerent.) Does that make sense? Thanks, Andy, for this blog post… thought I should weigh in on the PAR issue from the perspective of having worked on ‘Staging the Henrician Court’ and ‘Staging and Representing the Scottish Renaissance Court’. I’m not in a position to comment on using actors’ decisions as evidence in PAR work because that is never something we did, and indeed is not always the central methodology of such work. STHC and SSC largely staged plays in extant or authentic spaces to discover more about the politics of and interaction between site and play, drama and architecture, in court drama. And while some of that exploration was guided by actorly choice (as well as costume, set design, staging, etc), that was never construed as direct evidence but rather as a way in which those research concerns were illuminated, or as a means to open up further questions beyond the production – not just about performance but about history and politics more generally. I think to some extent critics of PAR get hung up on the evidentiary basis of that work, but our focus when ‘recreating’ has always been on the ‘creating’ rather than the ‘re’ – and what our interpretative/creative choices (like you, I don’t find it easy to draw a line – some of our creation is firmly rooted in historic documents such as the Revels Office accounts) then bring to the party in terms of expanding knowledge about the role and scope of drama as a form of counsel to and critique of monarchy. I fear to PAR critics that this might sound insufferably woolly. I suppose it partly depends how you think – the questions I want to ask and seek to answer are often made clearer to me when working collaboratively on a play, than in isolation on a text. Indeed, questions I could not even have imagined asking before working with practitioners usually form the foundation of my subsequent thinking/publications. I do not think that analysis of plays produced on the basis of PAR work is in any way inferior to work based in historic records. Another key bonus of PAR work is the way in which working collaboratively with practitioners shifts the weighting of the text, and I think that comes out in this blog post particularly well in the way that your attention was called to the word ‘silly’ and the yearning nature of the phrase ‘might I but’. Whilst working on STHC it was the word ‘matter’ which suddenly seemed to exert an inordinate amount of pressure on the text which – given the play’s allegorisation of the Henrician Reformation and the King’s ‘Great Matter’ – is significant. I don’t believe such knowledge necessarily or easily arises when we read rather than perform playtexts – not for me anyway. It is only through performance that you gain a holistic sense of the dramaturgy, and the way that certain words ring out, demanding that we pay notice. So this post is partly a plea. Criticisms of any methodology are right and proper and the limitations of PAR have been well expressed. However this does not invalidate it as a methodology, so can we now focus on its possibility and potential? If both ‘textual/literary’ scholars and ‘performance’ scholars made more effort to work together, equally, respectfully, and reciprocally, I know that the field would make new and exciting discoveries. p.s. sidenote – I expect you’re aware of the ‘Seely’ family in Late Lancashire Witches?